Samwise 'Sam' Gamgee (6 April T.A. 2980[note 1] - Fo.A. 61; Shire Reckoning: 1380 - 1482; 102 years old when he sailed into the West) was Frodo Baggins' servant and the only original member of the Fellowship of the Ring to remain with him till the very end of the journey to Mount Doom. 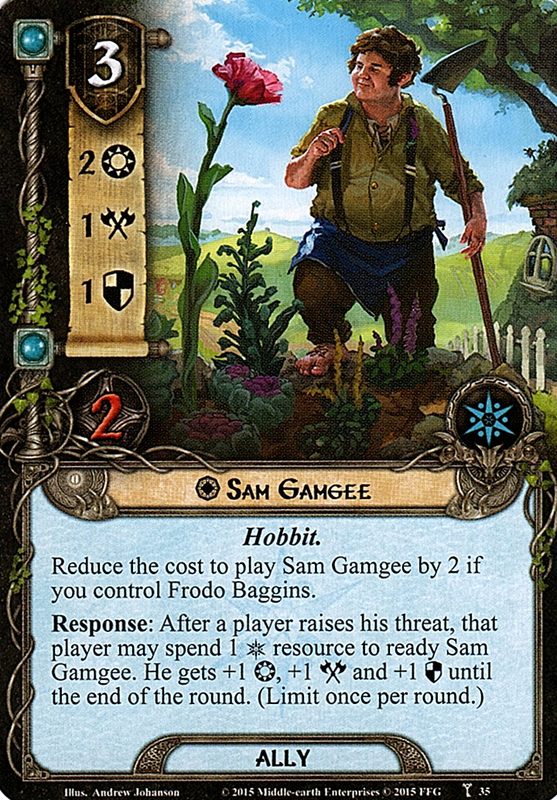 He lived with his father, Hamfast Gamgee, better known as 'The Gaffer', on Bagshot Row in the Shire, close to Bag End. Sam's mother was Bell Goodchild; he had five siblings: Hamson, Halfred, Daisy, May, and Marigold. Sam was one of the 'Conspirators' who were summoned by Merry Brandybuck in order to watch over Frodo Baggins and the Ring inherited by Frodo from Bilbo. Being the closest to Frodo, Sam was their 'chief investigator' who eavesdropped on his talks with Gandalf the Wizard. On 13 April, when Gandalf revealed to Frodo that Bilbo's ring is Sauron's One Ring, they noticed Sam eavesdropping. Initially suspected as a spy, Sam feigned innocent curiosity. As 'punishment', Sam was made Frodo's first companion on his journey to Bree and Rivendell. Sam and Pippin Took followed Frodo to his new house at Crickhollow where his and the Conspirators' role was revealed. Merry joined the travelers on their way to Bree. They passed through the Old Forest, the Barrow-downs and the Prancing Pony at Bree where they were joined by 'Strider'. Sauron's spies had opened the stables of the inn and all the mounts went loose, therefore before leaving the village, the company purchased a pony from Bill Ferny. Sam loved and tended the animal, and named him Bill, after his owner. 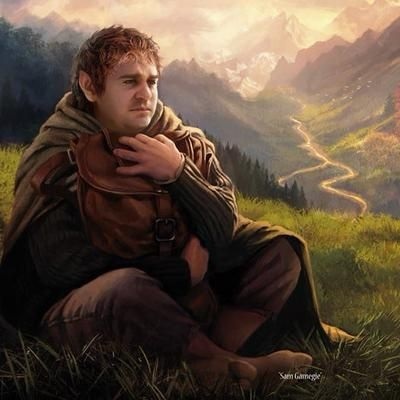 After Shelob attacked and seemingly killed Frodo, Sam took the Ring, intending to complete the quest, but upon learning that Frodo still lived, he rescued him from the Tower of Cirith Ungoland returned the Ring to him. Because he held the Ring for a time, he is considered one of the Ring-bearers. He married Rose 'Rosie' Cotton. In honor for restoring the Shire his family was given the name Gardner. After Will Whitfoot resigned his post as Mayor of Michel Delving (the largest town in the Shire and the 'unofficial capital'), in Fo.A. 6, Sam was elected Mayor of the Shire for seven consecutive 7-year terms. Samwise means 'simple minded' or 'half-minded'. Gamgee is a corruption of the name Gammidgy, a village in the Shire. Both names are presented as translations of the Westron form of Sam's name Banazîr Galbasi (also spelled Banazîr Galpsi) (q.v. for more information). 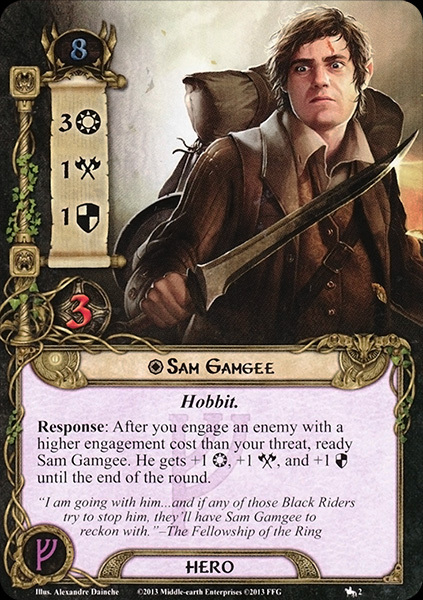 Sam Gamgee is by many regarded as the 'true hero' of Tolkien's story. Tolkien himself expressed this view in one of his letters: Sam is referred to as the 'chief hero', and special emphasis is placed on Sam's 'rustic love' for Rosie. The quest to destroy the Ring only succeeds because of Sam, who repeatedly saves Frodo from disaster (such as rescuing him at Cirith Ungol and carrying him up Mount Doom). He was one of only two Ring-bearers strong enough to surrender the Ring voluntarily. The relationship between Frodo and Sam is, in many respects, at the center of The Lord of the Rings. To the modern reader, it seems archaic, as it is extremely class-oriented. Sam's humbleness and 'plain speaking' is frequently emphasised in contrast to Frodo's 'gentility', and he often shows deference to Frodo, calling him 'Mister Frodo' or 'Master'. At the same time, a strong bond of love and trust grows between them, portrayed most poignantly during the events of Cirith Ungol, where Sam vows to return to his (apparently) dead master, to be reunited with Frodo in death. Compare to the relation between Don Quixote and his squire Sancho Panza, and the gradual 'Quixotization' of Sancho.